There are many reasons why StrawBerry Ridge near Tampa, Florida, has long been an extremely popular over 55 community. We boast an excellent location, attentively manicured public spaces, many recently renovated manufactured homes, and, of course, lots of onsite amenities. Another great feature of StrawBerry Ridge is the fact that we are a pet-friendly 55+ community. Though insurance regulations do require us to impose restrictions on certain breeds, we have no limits on the number of pets that our residents can own and actively recognize the myriad benefits that pet ownership can have for retirees. Residents of our 55 and over community near Tampa who own a pet know that doing so can be highly beneficial from both a physical and psychological perspective. Thanks to a few simple guidelines, like remembering to keep your pet on-leash while outside and picking up after him or her, StrawBerry Ridge facilitates an environment that is welcoming to both pet owners and non-pet owners alike. We recognize that pets are family for many of our residents and take pride in being a pet-friendly 55+ community. If you are looking for a welcoming place to call home during your retirement and would like more information about StrawBerry Ridge near Tampa, FL, please contact us today. 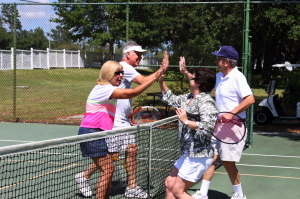 We are professionally managed over 55 community that offers retirees an affordably priced gated residential setting.